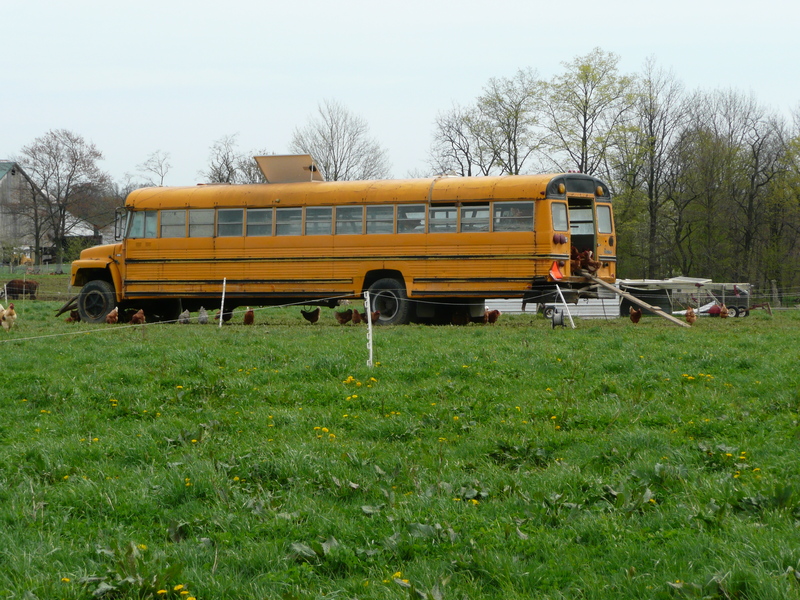 There are many joys in Amish country, but the most fascinating sight I’ve seen there is The Chicken Bus. The first time we drove by, I wasn’t expecting it, and so we went by kind of quick while I just looked out the window with my mouth open. Was that really a bus full of chickens out in that field? This was the first of two trips we took to that area to order our kitchen cabinets, and we went home a different way, so I didn’t get to see it again that day. I thought about it a lot, and made it a priority to stop so that I could stare at it during our next trip. On our second trip, we didn’t see it on the way there and weren’t a hundred percent sure where it was. So, as we were leaving our kitchen appointment, we asked about it. 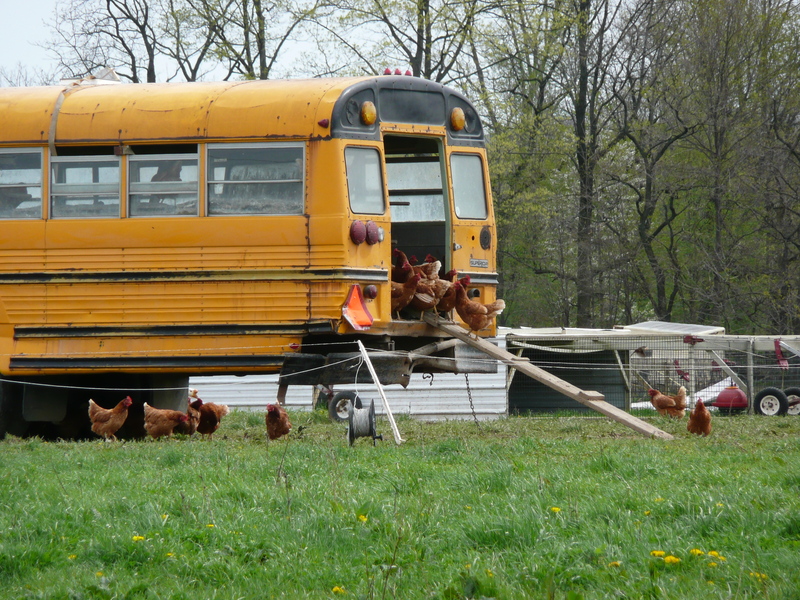 Our Amish kitchen cabinet guy said, ‘oh yeah, the chicken bus’. He told us that the farmer was raising them as free range, organic chickens, (I’m assuming for the organic eggs) and they lived in that bus. He told us that it was just a mile or so up the road. And we were off. I was so excited. We pulled off to the side of the road so I could take a few pictures. You can see that there is a solar panel on top. I don’t know what for – maybe he has heat and A/C in there for the chickens? I hope so. Plus, they have a huge field to run around and peck each other in. Now, I don’t eat eggs, but if I did, these are the kind of eggs I would eat. These chickens seem to have a pretty good life, and given their surroundings, I’m assuming their farmer doesn’t torture them. 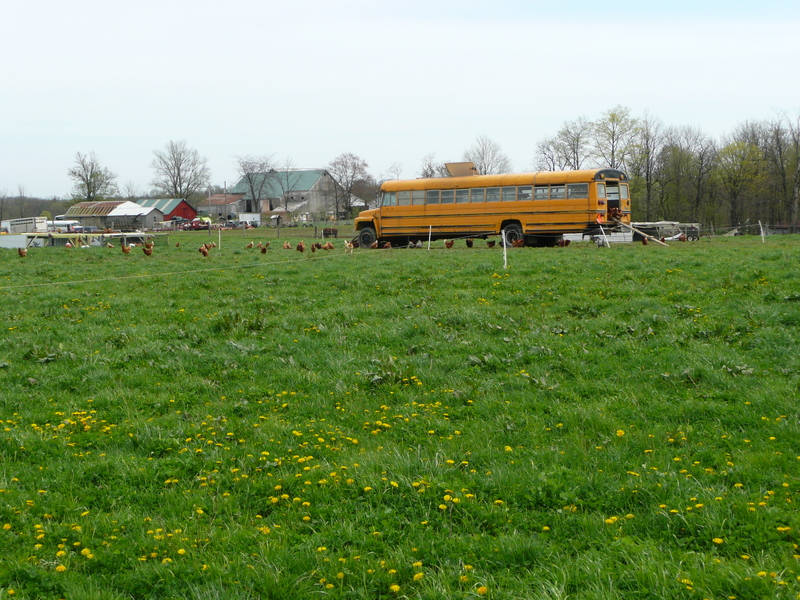 You can see from this photo that there is a ramp conveniently located out of the back of the bus, so the chickens can freely move inside or outside. Also note the solar panel on top. Here’s a close up of the chickens. Perhaps they need two ramps – it looks like a bit of a traffic jam up there. And here is a fuller view, showing just how much area they have to frolic about. Looks like a pretty amazing life for a chicken. Until they get their throats slit. But, let’s not think about that. I just love seeing things and places like this – tell me if you’ve seen anything crazy lately! This entry was posted in Observed, Uncategorized and tagged Amish, bus, chickens, eggs, farm, organic. Bookmark the permalink.